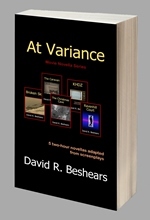 as individual titles in print, ebook and audiobook! The year is 1964. Ben Foster and his friends explore the strange goings-on in their isolated neighborhood, with each discovery bringing them closer to the incredible secret of Ravenhill Court. John Smith is the first person ever sent downstairs due to a mix-up in the paperwork. While this is sorted out, he is assigned to work at Hades’ local television station, where he must deal with strange characters and stranger programs. Jack and Amanda go in search of a mythical cavern their grandmother went looking for fifty years earlier… when her brother Bill was lost, never to be seen again.